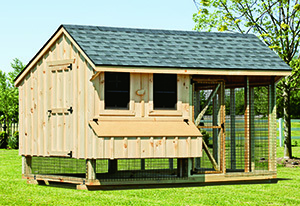 A few modifications to our standard line of loved chicken coops gives you the perfect duck coop! You'll need bigger nest boxes, of course you won't need the roosing bars, and a 12" wide by 16" high opening for your duck door will work much better than the smaller standard chicken door. That's it. Your ducks will enjoy the safe, secure, comfortable duck house. We make our duck houses from scratch so choose from our standard line and request the standard duck modification package at no extra cost or create your own. We can help with the design or tell us about the custom duck house that meets your needs and we will build it for you. 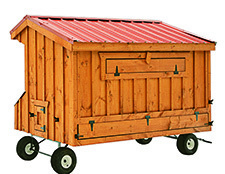 Duck Coops Can Be Delivered Anywhere in the Continental US. They Will Arrive Fully Built. 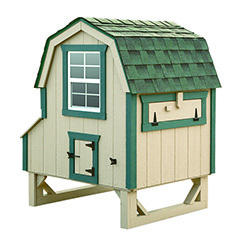 Duck houses can be customized to your specifications. 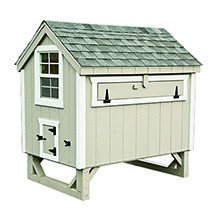 Our Safe Duck Houses are Available in the Same Models with the Same Options as our Chicken Coops.